"Though invisible to the general public, billions of people indirectly use C++ every day. Pervasive in computerized systems everywhere, the Google search engine is written in C++ as is most of Google’s supporting infrastructure. The communications parts of smartphones are in C++ as well as much of the telecommunication systems that connect them. C++ is key to many of tools of the movie industry and the higher levels of the Mars Rover software. C++ libraries underlie the current efforts in artificial intelligence, machine learning, and autonomous vehicles." (Source: The National Academy of Engineering). 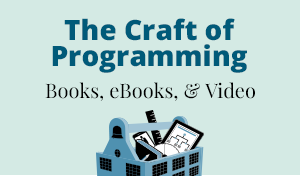 We have books, ebooks, and video for all levels of experience, from no programming to those already using C/C++ everyday. David Vandevoorde, Douglas Gregor, and Nicolai M. Josuttis show you a walk-through of C++ metaprogramming and how to achieve more functionality with less effort. *Displayed prices reflect our everyday savings price and are subject to change. Any discount codes used during checkout are applied to list (crossed out) price not sale price. Discount codes cannot be combined with any other offers including the Best Value book/eBook bundles.